Live in Japan? Got plans for this weekend? 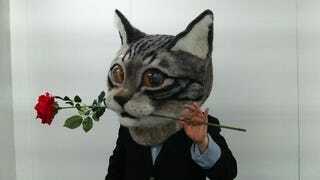 You know, you can always put on this large, unsettling cat head. As reported on BuzzMag and Togetter, this “Real Cat Head” will be on display starting this Saturday at the Tokyo Metropolitan Art Museum. It will be part of a larger, free exhibit that will run from April 18 to April 23 (note that the museum is closed on Monday). The wool wizards at the Japan Wool Art Academy made this “Real Cat Head,” which museum visitors can try on and freak each other out with. And yes, you can even have your photo taken with that thing on your noggin! If you are not familiar with felting art, this YouTube video will bring you up to speed. The Japan Wool Art Academy is headed up by Housetsu Satou, who has published books on felt art and who now teaches people how to make incredible wool creations.